Last year, outdoor recreational retailer REI decided to shut its doors on Black Friday and encourage consumers to #OptOutside instead of standing in long lines at stores. They are back at it again this year with their campaign and already have almost 2 million people that have pledged to venture outside with them. If you’re in Mesa for the holiday weekend, we have rounded up some outdoor adventures should you choose to forego shopping for great deals. Head out of the shopper-filled city and enjoy the Sonoran Desert at Usery Mountain Regional Park or the beautiful Superstition Wilderness at Lost Dutchman State Park. There are so many hiking trails to explore with levels of difficulty ranging from easy to difficult. Usery Park also offers wonderful programming throughout the year. On Black Friday you can join Sonoran Desert 101 and learn about the native plants and wildlife while taking a scenic stroll along the quarter-mile Desert Hawk Trail. Round up the kids and spend your day outdoors at Riverview Park. 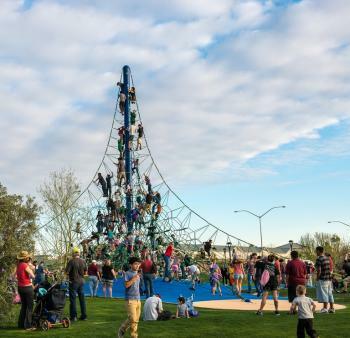 A 50-foot tall climbing tower, two playgrounds, and a 60-foot-long caterpillar mesh rope climbing structure make for plenty of fun for the little ones. There are multiple shaded picnic areas, so turn that leftover turkey into a sandwich and bring along lunch. If you purchase a Community Fishing License beforehand you can throw out a line and hope to catch rainbow trout, largemouth bass, channel catfish, or carp. Mesa was named one of the top 10 cities for bicyclists by Forbes magazine and it’s not too hard to see why. There are more than 40 miles of bikes lanes and close access to a plethora of desert biking trails to explore. If you’re looking for a leisurely cruise, check out the Grid Bikes for rent in Downtown Mesa. Wanting to hit the road instead? Road biking enthusiasts love to soar down the popular Usery Pass Road toward Usery Mountain Regional Park with rows of saguaro cacti and desert brush at each side. Kick it up a notch and mountain bike through the expansive terrain in the Superstition Wilderness or take the scenic route along Power Road into the Tonto National Forest. If you choose to opt outside but don’t want to break a sweat, you can sit back and relax with a cruise along Saguaro Lake on the Desert Belle. Enjoy a 90-minute narrated cruise with spectacular views of canyon walls and saguaros as far as you can see. You will learn about the history, geology, geography, and wildlife of the Sonoran Desert surrounding you. Enjoy the wonderful fall temperatures in Mesa and head out on the green for a round of golf. Longbow was recognized as one of the “Top 100 Resort Courses in the Country” and ranked as “One of the Top 20 Best Courses You Can Play in Arizona,” by Golfweek. If a game of flag football on Thanksgiving morning has always been a tradition in your family, you can add a new one in the mix with a competitive round of golf on Black Friday. 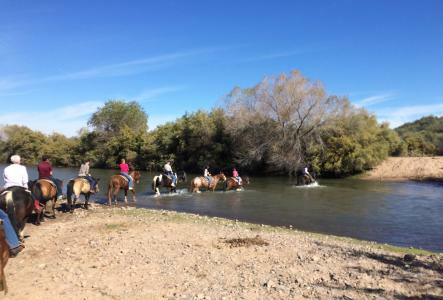 Hop up in the saddle and enjoy the Sonoran Desert on horseback. Fort McDowell Adventures will take you for a ride through the Fort McDowell Yavapai Nation, a 40-square mile reservation representing the ancestral territory of the once nomadic Yavapai Tribe. Don’t let your Thanksgiving turkey make you too sleepy, you’ll want to keep your eyes open to see wild horses, towering saguaros, and breathtaking landscapes. When hashtagging #OptOutside, be sure to include #VisitMesa so we can see your outdoor adventure!